This month marks John “Bomb ‘Em” Bolton’s one year anniversary as White House National Security Adviser. And in just a year, ultra-hawk Bolton has destroyed multiple, vital international treaties, and is dragging us inches from two wars of choice with Venezuela and Iran. And we could be the ones to push for his impeachment. 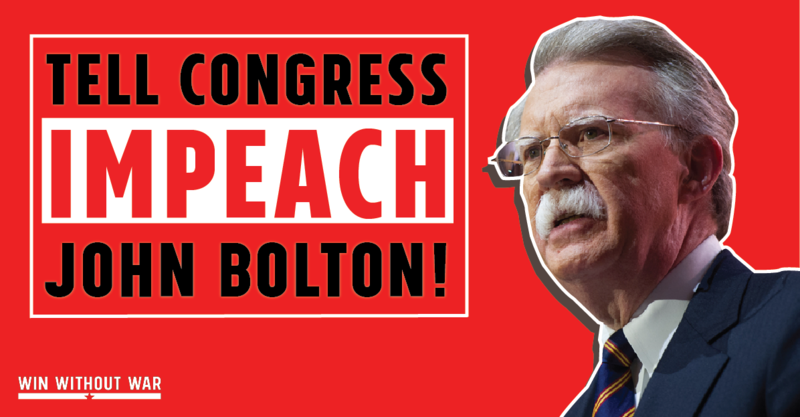 If we can show there is urgent political will from people across the country to end John Bolton’s warmongering reign, the U.S. House of Representatives could begin the official impeachment process. John Bolton is a destructive warmongering force in the White House. You must impeach him!